A charming traditional berber room, with troglodyte private bathroom. Are you looking for deep and authentic Morocco? Do you wish a holiday out of the beaten tracks and far from the crowds? Would you like to experience the traditional Berber life? Don't you aim at relaxing and getting away from it all? Or maybe would you prefer walking at your own pace in the Atlas mountains? Or rather enjoy activity holiday suitable for families ? Welcome to Les Terrasses de l'Atlas! Our Berber guesthouse is located in the heart of the western High Atlas, 45 minutes north of Taroudant, 1.5 hour from Agadir airport and half a day from Marrakech. Les Terrasses de l'Atlas offer overwhelming views over the green fields of our mountain oasis and over the High Atlas 3500 m peaks. Our guesthouse proposes an original and peaceful stay, combining the local way of life together with a comfortable accommodation which fits to European standards. 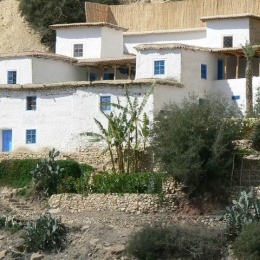 Our traditional house is set up in an idyllic place for relaxing and sunny holiday, whatever you want to escape for one day from Taroudant or Agadir hassle, or to experience during one week mountain activities tailored to your needs. Luc and his young Berber wife Hafida welcome you in a friendly and family atmosphere. The guesthouse is overlooking a permanent spring and a nice stream where you could bathe easily at any time. The original rooms surround various courtyards and enjoy panoramic views from the terraces. Our traditional but innovative cooking will for sure please you. Luc and Hafida will be pleased to share most of your meals as it should always be in a true guesthouse! Whatever you are a lonesome traveller, in couple or have a family with children, our wide range of tailor-made activities and excursions will make you busy the whole week ! The organization is flexible : Luc brims of ideas and will always adapt your stay according to your wishes; and you can rely on Hafida to care of you. The atmosphere is family friendly and the place never crowded : we aim at quality, not volume ! Try to leave your watch in the bottom of your bag and switch your phone off. Forget your western habits, your stressful job and just come!